We are excited to announce the general availability of backup for premium storage virtual machines using Azure Backup to protect enterprise applications such as Oracle DB, Cassandra and SAP running on Azure IaaS. It is available in all regions where premium storage is offered. 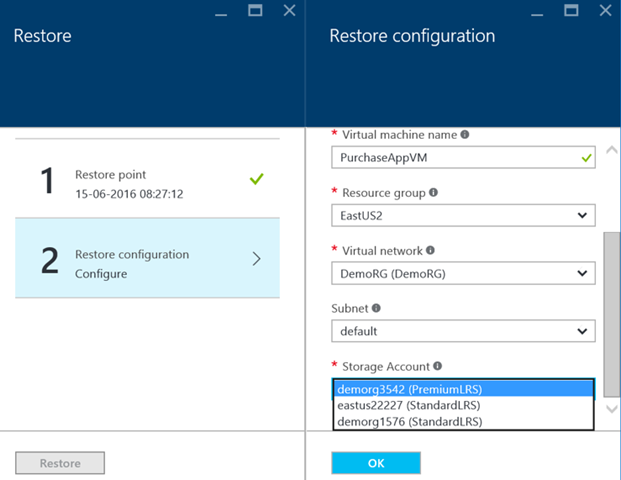 Backup can be enabled for both classic as well as ARM (Azure Resource Manager) virtual machines with premium disks. Restore process provides the flexibility to restore the data to either premium or standard storage accounts. If the restored virtual machine needs the same performance characteristics as premium storage, it can be restored to a premium storage account; for all other use cases, it can be restored to VMs for standard storage, which is cheaper. One of the reasons customers deploy premium storage for virtual machines is to satisfy the IOPs requirements of enterprise critical workloads. Backup data is initially copied to the customer storage account as a staging area before it is copied to the backup vault. This is to minimize the impact of IOPS on the production workload while efficiently transferring incremental changes to the backup vault. Once the backup data is copied to the vault, the staging area is cleaned up. If you are an existing Azure backup customer, start configuring the backup on Azure portal.